A Shepherd's Heart: Free Audio Book Download for July: Crazy Love: Overwhelmed by a Relentless God. Free Audio Book Download for July: Crazy Love: Overwhelmed by a Relentless God. 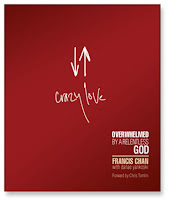 Free audio book download for July from Christianaudio.com - Crazy Love: Overwhelmed by a Relentless God. I've heard good things about this book and I've downloaded it and I'm looking forward to listening to it myself. If you don't have an account, you just need to sign up for a free one and then sign up for their newsletter that informs you of the monthly free download which provides the coupon code for the free downloads. Enjoy! Click on the following link to go to the site.